Ideal Christmas gift! Available from the salon. 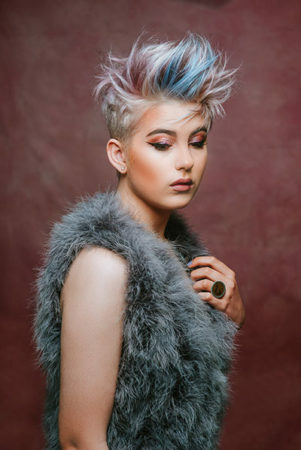 Super excited to announce Northland Hair Company’s winning photo for the NZ Association of Registered Hairdressers Editorial Stylist of the Year Competition! So good to have three stylists in the finals this year and then to get a winner, bonus! Once again thanks to our photographer Jess Burgess, always working hard for us. Make up Claudia Louis-Marie and our models. To welcome the coming of the cooler months we have lots of exciting news! For our clients who don’t already know our lovely Pep has decided it is time for another great adventure – and has moved South to join her husband. She will be greatly missed at the Salon and we wish her well in her future endeavours. “Hi my name is Angelique and I love to cut and colour hair. I can give you a new style that will have your friends and loved ones saying you look fabulous! I started hairdressing 12+ years ago at Servilles Hairdressing Academy. This is where my passion as a hair stylist started and since then I have worked in many prestigious salons across Auckland, including Servilles and Morgan and Morgan, Takapuna. What I love most about my job is transforming and creating a look for someone that they absolutely love and feel like they are worth a million dollars. My service is the full package from consultation – where I take my time to identify your needs and wants in a hairstyle that will suit you and your lifestyle, to recommending the best in professional hair care, tips and techniques to recreate and care for your new style at home. We would also like to introduce our lovely new apprentice…Shontelle! We pride ourselves on giving the opportunity to our young trainees to gain their qualifications in our salon. Shontelle is already showing great skill, passion and promise. We believe we are very lucky to have her in our Team. The addition of Shontelle, means Stacey, who is no longer our youngest team member, can now move forward and establish herself on the salon floor full time. Stacey has already been producing some amazing colour work and we really look forward to seeing her growth and creative magic unfold. Of course – Meredith, Laurel and myself are still here, working our regular hours and supporting our new team. We look forward to introducing them to you! Stacey and Sharon have recently been to Auckland to receive formal training with tape-in hair extensions. Two different techniques. In these photos Stacey, before & after pics on left, is wearing hers for added length. For me, receiving extensions on the right, it was all about getting body back into my hair as it is incredibly fine. I have had extensions cut to my own hair length. This has resulted in thicker hair, feels great! I never realised my hair was so long – because it was always so thin. Fantastic results. Please call us if you want to know more about this service.